Shortly after I asked this morning, How shall we play today?, an image of a horseshoe came to mind. And not just any horseshoe, but an old black one that was hanging on the wall in my closet. This horseshoe hung for years and years on the hallway wall in the home of Leta and Bob Moore. I brought it home when we packed up their house and tucked it away and forgot about it…until today. 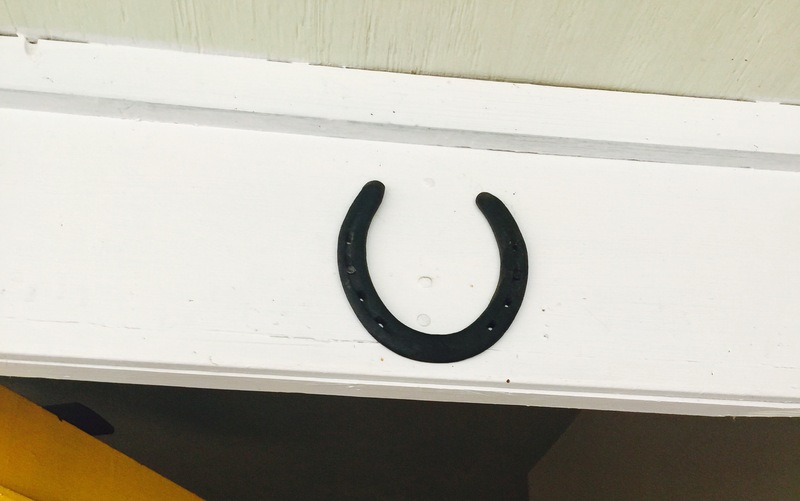 This afternoon, in preparation for retrieving this vintage horseshoe and hanging it properly, I looked up the mythology around lucky horseshoes and why we hang them over doorways. I discovered the story of hanging horseshoes for luck goes all the way back to 959 AD. According to Irish folklore, a blacksmith named Dunstan had an encounter with the devil. There are many variations of the tale, but the gist is that the devil asked Dunstan to shoe a horse. The crafty blacksmith grabbed the hoofed foot of the evil one and nailed a shoe to it instead. Howling in pain the devil asked to be released. Dunstan agreed, with one condition…the devil had to promise to never enter a house with a horseshoe hanging above the door. Because of this Irish story, the horseshoe became a symbol for luck. Additionally, iron was deemed magical because it could withstand fire. Hanging the horseshoe above the door to a house or building, with the points up so that it forms a U, keeps evil away while collecting luck. Reading the story behind the luck that a horseshoe supposedly brings, changed my plans. I was going to hang Mimi Leta’s horseshoe in the backyard garden area, on the wooden fence or perhaps above the garage door, as a nod to tradition. But suddenly, I fancied hanging it above my front door. I believe that we make our own luck, according to how we perceive life and the world. However, I love blessings. And I have Irish blood. 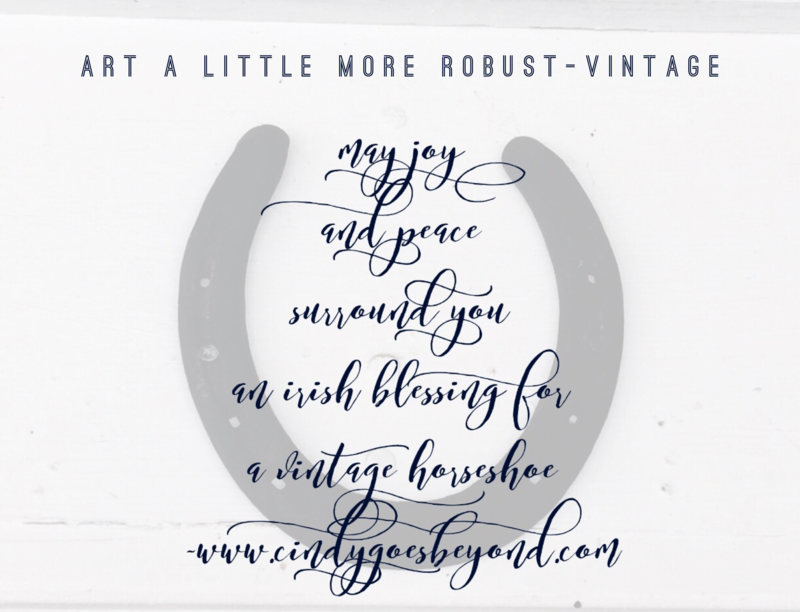 What if the horseshoe symbolized a blessing for all who entered through my door, rather than just luck? That inspired idea resonated deeply with me. I found the perfect Irish blessing. 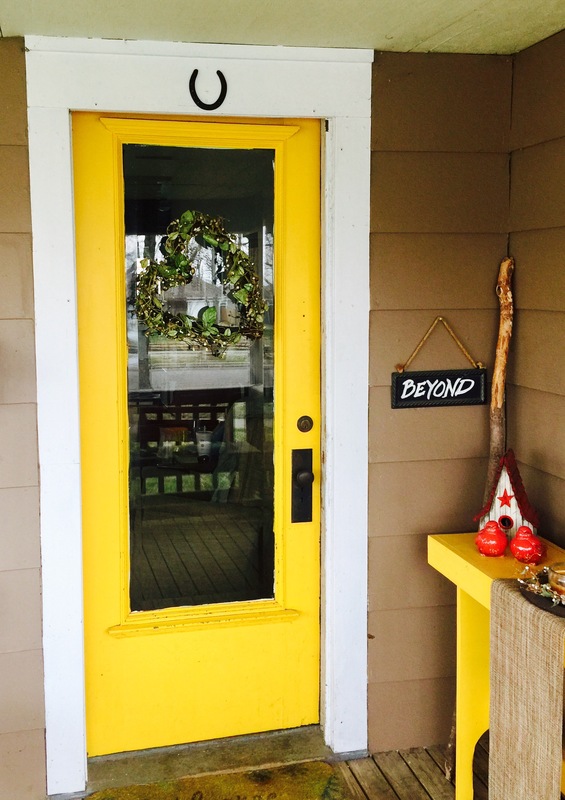 I like that the vintage horseshoe now hangs above my front door. It draws my eyes upward, and in my heart I hold the blessing. I foresee a future art project, where the Irish blessing takes on material form and hangs near the entrance to my home. Was it a coincidence that as I was preparing to hang the horseshoe above my door, the first tornado watch of the year was issued? I don’t think so. We remain under a watch until 9:00 pm, as strong thunderstorms approach. The horseshoe doesn’t make me feel lucky. It does remind me that I am protected and loved and blessed. All is well.